Lt. Brian Ahearn, 43, was a father of two and lived in Huntington, New York. He loved baseball and had played for the FDNY team. Engine 230 had just come back to the station from another call when someone yelled “Turn on the TV.” They looked at the TV then ran up to the roof to look across the river at the North Tower on fire. They watched the second plane strike. Then the call came in to respond. They found their way through snarled traffic and closing roads across the river and parked at Broadway and Vesey – as close as they could get. All except the chauffeur geared up and headed in. They were last reported helping in Tower Two. 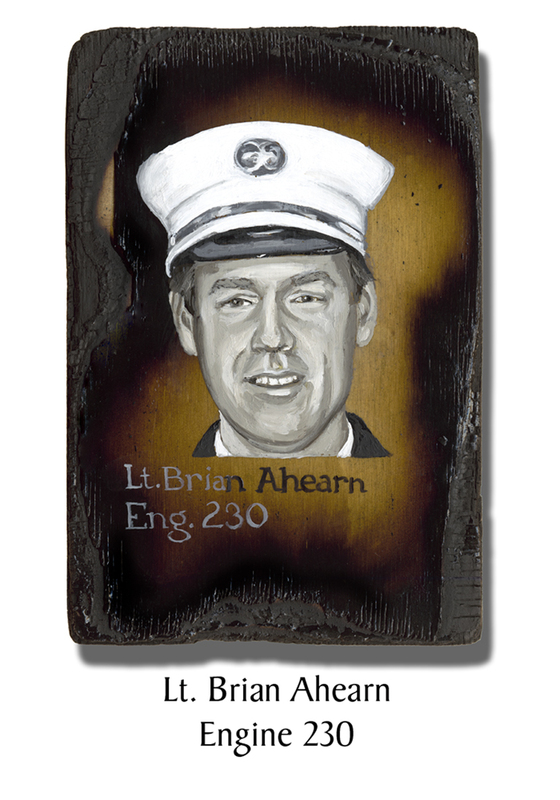 This entry was posted in Better Angels Stories and tagged 343, 9/11, better angels, Brian Ahearn, Dawn Siebel, Engine Co. 230, FDNY, firefighter, firefighters, firefighters of 9/11, LODD, Manhattan, memorial, NFFF, paintings, portraits, World Trade Center, WTC. Bookmark the permalink.